Tractor beams have long been the fantastical trope in science fiction, with its renowned application being showcased in Star Trek. As for the simple definition – a device is said to have a tractor beam if it is able to attract/move a singular object to another from a distance. In that regard, a team of scientists from the Universities of Bristol and Sussex have collaborated with Ultrahaptics, to basically invent the world’s first sonic tractor beam. Pertaining to the term ‘sonic’, this ingeniously-devised contraption has the capacity to lift and move 3D objects by using sound waves. In essence, the tractor beam in question here utilizes high amplitude sound waves that are able to produce what is known as an ‘acoustic hologram’. This physics-based outcome in turn can be used for lifting and moving the object. In terms of the working scope, the researchers made use of an arrangement of 64 miniature loudspeakers that are capable of generating high-pitch (and high-intensity) sound waves. So when the sound waves are emanated by the tractor beam device, they surround the 3D object with high-intensity sound and sort-of create a force field. These ‘force fields’ in turn (regulated by the output of the loudspeakers) can either be used to keep the object in its place, or utilized to move and even rotate the body. In our device we manipulate objects in mid-air and seemingly defy gravity. 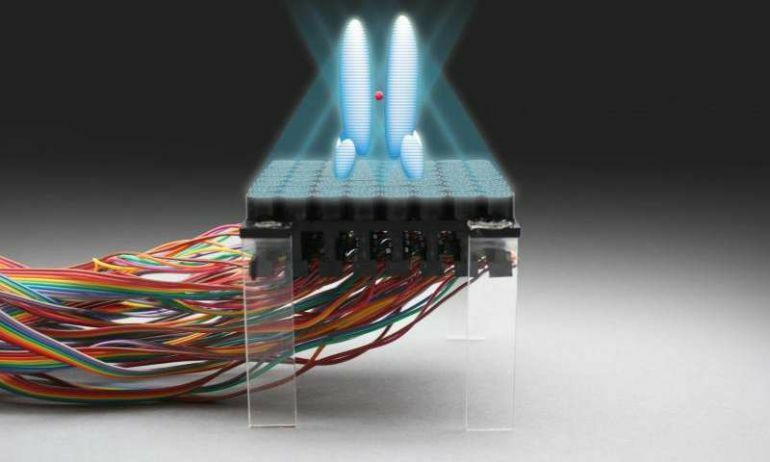 Here we individually control dozens of loudspeakers to tell us an optimal solution to generate an acoustic hologram that can manipulate multiple objects in real-time without contact. Now, the 3D object in question here, is just a lightweight polystyrene bead. 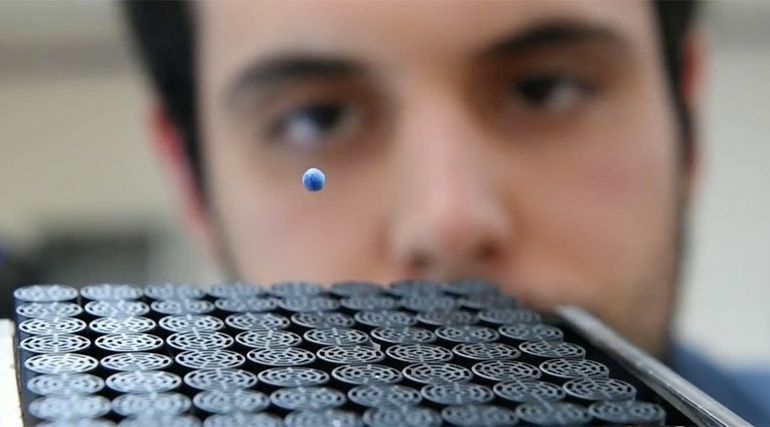 But the scientists are already developing more ‘advanced’ variations of the technology that can used for manipulating both bigger and smaller objects. For example, a stronger tractor beam can control a football from a distance of 10 m (or around 33 ft), while a more refined beam can potentially aid in altering and moving fine particles inside a human body. The latter part certainly alludes to micro-surgical procedures and delivery of special medicines inside humans. Of course, all of these ‘would be’ applications belong to the realm of futurism. As for now, we should be happy to just heap our praises on the current technology. That is because, while sound does have physical effects, this is probably the first that man has managed to control its output to such delicate levels for actually moving an object. The invention and its study was originally published in Nature Communications.